A long overdue homage to one of the UK's more interesting guitar players - a Tele to forge some sonic mayhem. Build. Sustain and playability. Contrasting and versatile sounds. It's too heavy. That bridge pickup might be too abrasive for some. The Coxon has a milky translucent blonde poly finish. Graham has added his signature to his signature model. 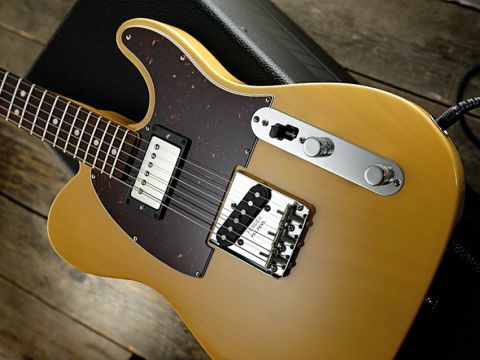 The vintage-style Tele bridge single-coil. The Coxon Telecaster is a Fender Europe exclusive. In the heady days of Britpop, Blur's Graham Coxon was one of the biggest guitar players on the planet. Rather belatedly then, Fender honours him. Back in the mid-nineties, two guitar players dominated the Britpop pack: Oasis' Noel Gallagher and Blur's Graham Coxon. 15 years on Coxon, thanks to a series of well-received solo albums, not to mention Blur's 2009 reunion, is still a player who commands respect. "Unplugged, there's certainly plenty of new-string Tele zing, and this translates to the guitar's amp'd sound." So it's good news, then, that Fender has finally acknowledged the appeal and influence this archetypal anti guitar hero's attitude and his approach to playing has had on a generation of players. Known for his use of '52 Tele reissues during his Blur days, this (European-only) signature is modelled on a later acquisition, a '68 Tele, "that some lunatic had butchered and put some PAF pickup in where the neck pickup is," Coxon tells Fender News. "But that's the one I've been playing pretty much all the time… it's kind of a Frankenstein, but it's my favourite guitar to hit." It's hardly a new concept, of course, and pulling it from its gigbag, the ash body gives this guitar some serious weight. But, that aside, it's typically well done. The milky translucent blonde poly finish allows the bold grain of the body wood to show through subtly, with the edge radius slightly bigger than fifties vintage contributing to slightly more seventies vibe - certainly in terms of weight. But the neck appointments stick to the older style with a four-bolt neck joint and body end truss rod adjustment. The maple neck sports a pretty standard 'C' profile, while the clean rosewood 'board features a flatter, modern radius and chunkier medium jumbo frets. The set-up is good, if a little low and buzzy when you dig in, which makes for an easy player, albeit lacking some of the character of the older, smaller radius/thin-fret Teles. The primary twist, of course, is the neck humbucker, mounted here in a shallow black ring on the tortie-faced laminate pickguard - although the pickup is sunk down under its edges. We have only master volume and tones here, so balance between the two pickups can only be done via height adjustment. On the subject of pots, a subtle change is the use of 375k ohm pots instead of the more usual 250k ohm, which in theory should produce a subtly brighter tonality enhanced by the presence of three 1958-68-style threaded steel saddles. Unplugged, there's certainly plenty of new-string Tele zing, and this translates to the guitar's amp'd sound. There's less depth to the Coxon than last issue's American Vintage '72 Tele Custom, which sounds - and feels - a lot older, while our similarly spec'd vintage '69 Tele also sounds deeper and darker. But that's observational, not critical, because where this Tele scores is in its visceral attack: crank up the amplifier level and add some gain, and it sounds way more punky. Brittle those highs might be, but they ring for days. Think brutal Townshend and Weller… and Coxon, of course. And that's just the bridge pickup, which, incidentally, is nicely tamed by the well-tapered tone control to produce a subtly rounder and fatter voice. Switching to the neck pickup we have a slight but not huge volume increase, with the highs now more rounded and a much thicker mid-range appearing. Smooth leads fall off the guitar, with clean amp tones you can comp jazz, and with some serious fuzzy gain you have thickness to drive the fizz. But its about feel and playability too - and the guitar scores highly for both thanks to the frets, 'board radius and, we have to say, the polyurethane neck finish - it's fast but not sticky. A brutal, vicious sounding Tele bridge pickup mixed with a mellower, old-style Gibson neck humbucker and a full-bodied mix: hold on to your hats! It does seem rather long after the event to honour one of the UK's most individual guitarists but, in this case, it's definitely better late than never. This Coxon Tele is well priced, very tidily made and has a combination of abrasive cutting power from its single-coil and more liquid fluidity from its neck humbucker. You don't have to be a Coxon wannabe to enjoy that versatile blend - it just might prove a favourite for any alt-rockers out there.